Are you having difficulties with your "black-box" batching controllers? Melfi Batch© is the next generation of PLC-based Gain-in-Weight, Loss-of-Weight, Weighbelt and Flowmeter automated batching controllers. The system is designed to directly replace the proprietary microprocessor equipment supplied by any of the popular LIW feeder manufacturers. . The Melfi Batch© PLC controller has been developed around the Allen-Bradley ControlLogix and CompactLogix hardware platforms, using standard RSLogix5000 programming software with Rockwell Automation FTview HMI. The field communications to the Hardy Instruments loadcell amplifiers are open standard Ethernet/IP components. We have created a cost effective solution using non-proprietary hardware to simplify the gravimetric batching control process. Interoperability: control, process monitoring, communications, information collection, client/server based recipe and reporting all within one completely integrated and scalable batching solution. Melfi Technologies has completed a gravimetric feeder control retrofit at a major PVC cable producer. The raw materials used in the PVC compounding are stored in various silos, tanks, and bag dump stations. The purpose of the material storage system is to provide sufficient product to the PVC compounding process. A pneumatic conveying system controls the transfer of material from storage bag dump stations to the respective feeders. Vacuum receivers mounted directly on the feeders provide an intermediate storage buffer between the bag dump and the respective feeder. The batch feeder hopper is automatically refilled on demand. 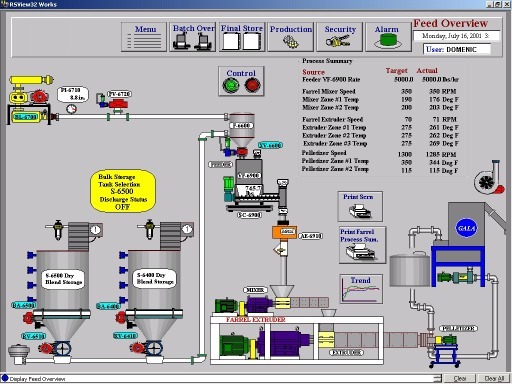 The gravimetric controller has been developed around the Rockwell Automation ControlLogix and CompactLogix hardware platforms, using standard RSLogix5000 programming software with RSView32 HMI. The field communications to the motor drives and load cell amplifiers are open standard Ethernet/IP components. 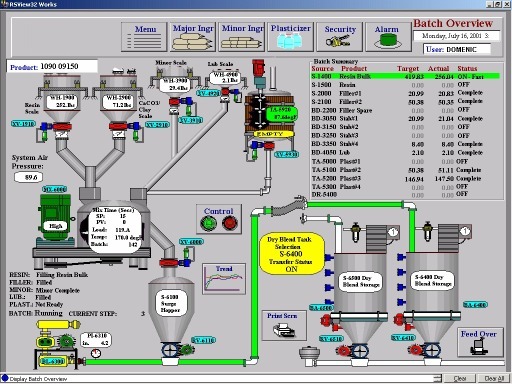 After reviewing both their control system capabilities, and previous batching installations, Melfi Technologies was awarded the project to convert the complete compounding line using the automated Melfi Batch© system. The entire proprietary microprocessor-based control system was removed and replaced with an Allen-Bradley ControlLogix PLC performing the weighing algorithms. Hardy Instruments C2® Ethernet/IP weighing modules were mounted onto the individual batching devices to directly read the loadcell weight. The Hardy C2® certified loadcells communicated the calibration parameters to the Ethernet/IP weighing modules, so the feeders could be calibrated without the need for calibration weights. In addition to the batching function, the controller directly controls the continuous Loss-in-Weight feeder that meters the PVC Masterbatch into the twin-screw extruder. 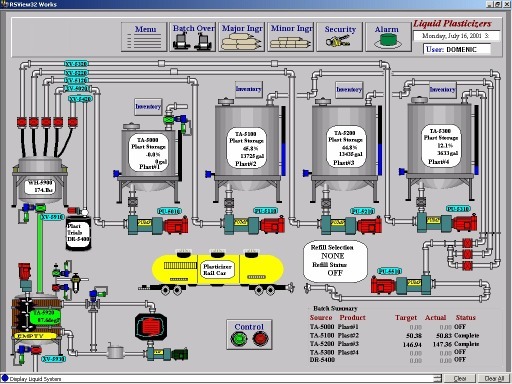 Communications to the existing mixer and extruder controls ensure all information is available in a central location. The line was retrofitted, commissioned and operational within a two-week time span. The automated batching system continues to perform well, with greatly reduced downtime due to electronics failures. Since the initial commissioning there have been no additional service or repair return visits by a Melfi Technologies field programmer.